A stylish Bedford hotel with free WiFi and easy M1 accessHoliday Inn Express® Bedford hotel sits next to the A6 junction with the A421, a short drive from the M1 motorway and A1.Half an hour by car takes you to London Luton Airport (LTN), while the market town of Bedford is in close proximity. Sports fans can tee off at the nearby Bedford Golf Club or experience the thrill of driving a Formula One car at the Silverstone Circuit, a 40-minute drive away. Bedford, with its pretty riverside quays, offers a twice-weekly Charter Market with street stalls selling fresh produce. 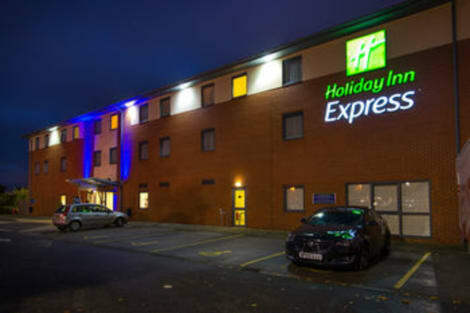 On a rainy day, head to thecentre:mk indoor complex, a 30-minute drive away in Milton Keynes, for restaurants and more than 200 stores.At this hotel you can enjoy:- Free WiFi throughout the hotel- Complimentary on-site parkingBright guest rooms feature a pillow menu and blackout curtains for a good night’s sleep. Two fully equipped meeting rooms can host events for up to 30 people. At the end of the day, relax in the comfortable lobby lounge with a tasty burger and a cool drink from the licensed bar. Located in Bedford, Tennyson House Hotel is a 4-minute drive from Bedford Park and 6 minutes from St. Paul's Church. This hotel is 14.3 mi (23 km) from Woburn Safari Park and 15 mi (24.2 km) from Gullivers Land. Make yourself at home in one of the 8 guestrooms featuring DVD players. Complimentary wireless Internet access is available to keep you connected. Bathrooms have showers and hair dryers. Conveniences include desks and coffee/tea makers, and you can also request cribs/infant beds. Make yourself at home in one of the 120 air-conditioned rooms featuring LCD televisions. Your Select Comfort bed comes with premium bedding. Complimentary wireless Internet access keeps you connected, and satellite programming is available for your entertainment. Private bathrooms with shower/tub combinations feature complimentary toiletries and hair dryers. Satisfy your appetite for lunch or dinner at the hotel's restaurant, River Room Restaurant, or stay in and take advantage of the 24-hour room service. Wrap up your day with a drink at the bar/lounge. Buffet breakfasts are served on weekdays from 6:30 AM to 10 AM and on weekends from 7:30 AM to 10:30 AM for a fee. Make yourself at home in one of the 20 guestrooms. Satellite television is provided for your entertainment. Bathrooms have shower/tub combinations and complimentary toiletries. This charming hotel can be found in Bedford. Customers will enjoy a peaceful and calm stay at Tree Garth as it counts with a total of 3 accommodation units. Pets are not allowed at this property. 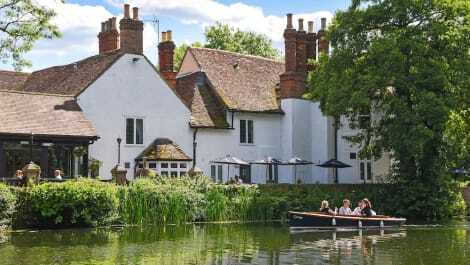 Known for having one of the finest riverside settings in the country, Bedford offers panoramic views of the River Great Ouse from the site of Bedford Castle, which was destroyed in the siege of 1224. The ever-expanding London commuter belt has meant increasing prosperity for Bedford, which means a whirlwind of activities and facilities for visitors. Bedford offers something special, with undercover shopping malls, winding back streets filled with treasures and a great deal of history and character. A number of interesting state-of-the-art buildings and structures have recently been built, including the iconic Butterfly Bridge opened by Prince Charles in 1998. Bedford's numerous galleries and museums include the recently transformed Higgins Bedford Art Gallery and Museum. With increased temporary exhibition space, it also boasts three cultural venues on one site: the Cecil Higgins Art Gallery, Bedford Museum and Bedford Gallery. The John Bunyan museum tells the story of John Bunyan (1628 -1688), the renowned author, pastor and preacher. Visitors are able to take a walk through Bunyan's life, hear Bunyan tell his story and ‘visit' him in prison. The Pilgrim's Progress, his most famous work, has been translated into over 200 languages, and many examples can be viewed here. Bedford Park is a Victorian urban park containing traditional English features such as a cricket pavilion and bandstand. Within the park the Robinson pool is open for outdoor swimming, and two children's playgrounds and a café are open during the summer. With over 20 golf courses in 477 square miles, clearly Bedfordshire is keen on golfing, and three of its most popular courses are in the town of Bedford itself. At Bodyflight, not too far away, you can experience the world's largest and best indoor skydiving wind tunnel. All ages can enjoy the fun and exciting sport of Bodyflying in the safety of a vertical wind tunnel. At Woburn Safari Park enjoy the experience of being just a windscreen's width away from rhinos, giraffes, lions, tigers, elephants, monkeys and much more, plus the action-packed Wild World Leisure Area. With eight daily animal demonstrations and shows, parrots flying down to feed from your hands, animal encounters and Sea lion Cove, you're guaranteed a great day out. Thurleigh Farm Centre is a working farm and children's activity centre offering an action-packed fun day out for all the family. Indoor play, bungee trampolines, trampolines, mini quad bikes, pedal carts, and fire engine rides are all available here. Bedford contains plenty of restaurants, bars, clubs and entertainment to enjoy, but it also has a distinctly large Italian community, who have opened up a wealth of Italian restaurants, bars, and delis in the area. 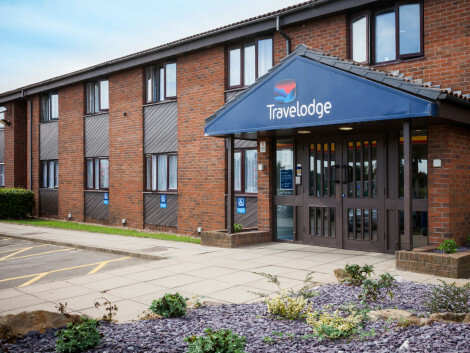 For whatever you like doing, whether it's walking or visiting galleries, eating out or indoor skydiving, our Bedford hotels can accommodate you, so book your trip today!